Completed Rock Guitar level seven in the year of 2004 from Hill Soung Music Academy, Manipur. Completed Classical Guitar Grade Five in the year of 2005 from Grace Musical Institute for Fine Arts. 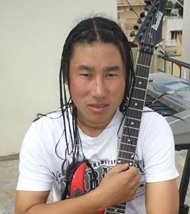 He was the main Guitarist for Antioch Band in Manipur. Worked in St. Clara's High School, Goa as a Music Teacher for one year. He plays Guitar in Rock & Pop, Jazz, Bluse, Classical, County and all other styles.